This page will walk you through the various parts of the pre-reg process payment script. For users of the system it is important that they understand the difference between processing a payment for a customer before the event and during the event. The difference is that when you use the pre-reg process payment script, all the items purchased are marked paid for, but none are marked picked up. Marking the items picked up happens using the cashier script. Which is why it is important to use the cash register program when processing payments at the event. The first step is to click the pre-reg menu and then click the process payment button. 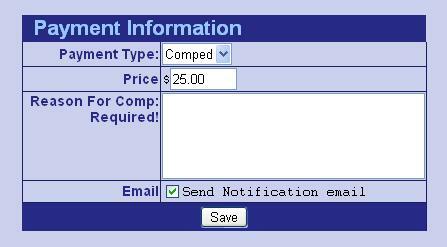 You will be then given a search box, where you can search for the user your recording the payment for. 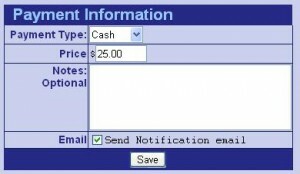 Once you have found the user, you will be provided with the following screen, you may add another user to this payment if you so desire, buy clicking add person to this payment. Once you have finished adding all the people who will be grouped on this payment, go ahead and pulldown and select your payment method. 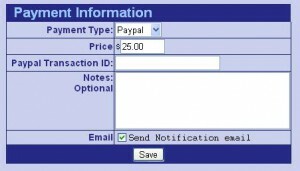 For Paypal - For paypal payments the payment system provides the following screen and requires the transaction ID of the payment from the paypal system. 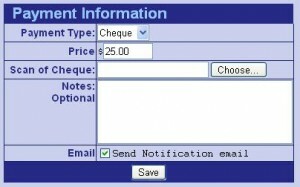 For Cheque - For cheque payments the payment system provides the following screen and requires the scan of the cheque in order for the payment to be successfully processed. For Comped Payments - Comped payments require a reason for the comp and will deduct money from the user's comp money available. For Cash Payments - Cash payments can be recorded and don't have any special requirements. Send notification email - This can be either checked or unchecked. If it is checked the system will send a email to the customer that the payment has been processed, and will provide information on how to download their AUP pre-convention if they need to. Save Payment - Click the save button to save the payment and send the appropriate emails.